Private Edens: Beautiful Country Gardens is a lush book that takes you into 21 outstanding east coast country gardens. They are well worth the visit. Each garden featured in the book looks like it could never be anything but what it is. What you see is clearly how the garden was always meant to be. In fact, most of the homeowners faced severe challenges that they had to overcome to realize their vision. The homeowners saw the potential of the land, and decided to work around the negative features, solving the problems with creativity and ingenuity. For example, a Potomac, Maryland property was meant to fulfill the wife’s lifelong dream of owning a small farm. Not far from Washington, DC, the owners found a 19th century house with charming outbuildings set on a five-acre plot surrounded by a “borrowed view” of pastoral land. For years it was perfect. But a snake entered their Eden. Out of the heartache grew a new gardening philosophy. Instead of focusing the garden on their now-ruined pastoral view, the owners learned how to design to screen and enclose garden spaces. Instead of looking outward, they created a garden that looks inward. The plethora of native stone was used to good effect on the upslope of the property with monumental stone steps threading their way through massive boulders and gravel paths and terraces contrasting with the foliage greens and creating, “a seamless transition from what Mother Nature has provided to what man has added.” On the downslope, the brush was cleared, opening up a wide vista, including a lake below and the Litchfield County hills beyond. In Hudson, New York, the couple fell for their property, not for the house, which was worse than they had feared when the real estate described it to them, but because of the outstanding view of the Hudson River and the Catskills. They overlooked the awfulness of the house, the immense amount of asphalt and gravel, and the “shoe-sucking expanse of marsh at the bottom of the property,” and decided this was, “a property in search of its paradisiacal self.” They would make it happen, but it wasn’t going to be easy. According to the homeowner, “Our topography is very demanding. Our land is steep. Some of it is very dry. Other areas weep. We have sand, clay, rocks, and not much loam.” Over the years, as the owners learned the requirements of plants and the importance of planting them in conditions suited to their needs, the garden began to flourish. In another New York garden, the owners transformed a 450-foot long and 40-foot tall granite rock ledge into a remarkable garden feature by cleaning it out, mulching it with peastone, and planting it with alpines. The project took them 15 years of hand work. The owners didn’t start out as gardeners, in fact they wanted nothing to do with gardening, but gradually they got bitten by the bug and their once overgrown property now has rock gardens, perennial borders, meadows, water, and vegetable gardens, to name just a few. 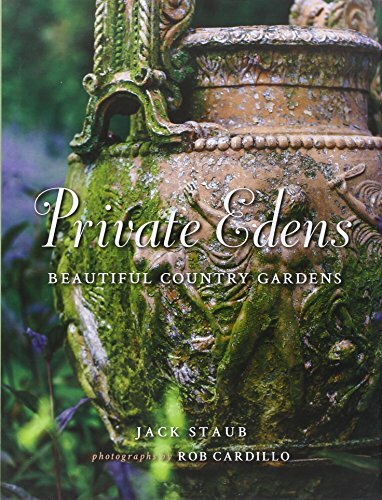 Staub’s description of each garden will enlighten your understanding of the owners, their goals for the garden, their trials, and their triumphs, but it is the photographs by award-winning photographer Bob Cardillo that will enthrall, making this book worth its $50 purchase price. These pictures draw you in, compelling you to pour over the book, as they illuminate the designs Staub describes. Relish the beauty of Cardillo’s framing and composition, use of light, and insight into details. From these photographs you’ll also glean insights about plant combinations, use of color and texture, and design features in each garden. They are inspiring both aesthetically and for the ideas you can take away for your own garden.